We want people in Devon to choose to live healthy lives – by taking responsibility for their own health and wellbeing and particularly by eating healthy food, moving more every day, not smoking, not drinking alcohol excessively, and being mindful of their mental health and wellbeing. We recognise this can be more difficult for some people and we want to see recognition of this in strategies to improve the health of the poorest much faster. We want to see a reduction in avoidable long-term conditions particularly in more deprived areas for example diabetes. The Board has a compact with the Local Nature Partnership and has delivered a ‘naturally healthy’ programme with a wide range of stakeholders including the National Parks making the most of Devon’s natural assets. Alcohol admission rates will improve. 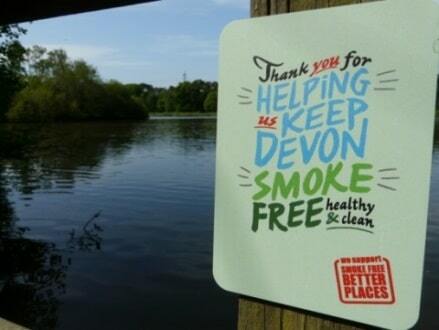 Stover Country Park near Newton Abbot is taking a lead in encouraging visitors to keep the park smoke free. New signs have been placed throughout the park’s picnic areas and bird hide to thank visitors for helping keep Devon smoke free. Stover is the latest addition to a number of smoke free areas in the county which now include many play parks and all of its children’s centre grounds, hospital sites and the Council’s County Hall headquarters. The 2015 visitor survey showed that people visited the park mainly to walk, exercise and enjoy the peace and quiet supporting the priority to keep people naturally healthy.